Infection control experts have recommended athletes take precautionary measures to limit the spread of disease in the Athletes’ Village in the final days of the Commonwealth Games following outbreaks of influenza and mumps among athletes last week. This follows an earlier outbreak of influenza infection in the village with three athletes from the same country placed into isolation. Ruby Tui Rugby Sevens player from New Zealand was struck down with mumps on the Sunshine Coast. Mumps is spread by direct contact with either saliva or droplets from the sneeze or cough of an infected person. International infection control expert Dr Cathryn Murphy said hand washing should be a priority because germs can spread to the hands by sneezing, coughing, or rubbing the eyes and then can be transferred to other family members or friends. “In Australia we are coming into influenza season, there are sensible things anyone can do to stay safe,” Dr Murphy – executive director of Infection Control Plus – said. “People need to make sure they are cleaning their hands after using the toilet, before eating, after sneezing and disposing rubbish. It can help to prevent getting infection or cold. “It is a good idea to have an antibacterial hand sanitiser and use it when you need,” she said. 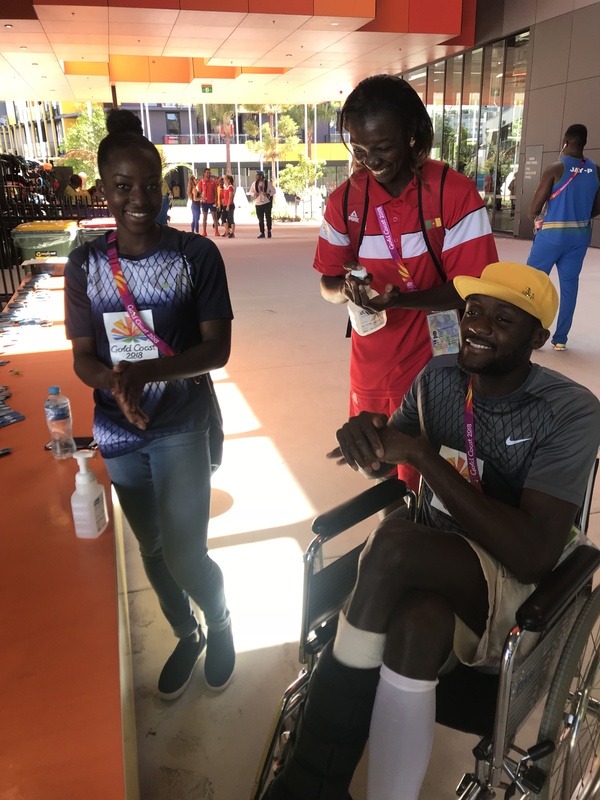 A 23 year old athlete was reportedly in a serious condition in Gold Coast University Hospital after contracting malaria last week, although officials said it was likely contracted before arrival as there was no locally acquired malaria in Australia. Norovirus is another common health threat when there is a big concentration of people in the same area, with cruise ships a common site for outbreaks. Noroviruses are a group of viruses that can cause gastroenteritis (inflammation of the stomach and intestines) with diarrhoea, stomach pain and vomiting. It is spread primarily person-to-person by the faecal-oral route including contact with contaminated surfaces and transmission via aerosolised vomit. Most Norovirus-associated gastroenteritis outbreaks occur where individuals live, work or play in close proximity such as aged-care facilities, hospitals and childcare centres. “If a person has symptoms of Norovirus, they should stay away from contact with others until they have been without symptoms for at least 48 hours,” Dr Murphy said. Gold Coast Public Health Unit suggests resting and drinking plenty of fluids to prevent dehydration, if a person is ill with vomiting and diarrhoea. It is important for people to continue to use good hand washing and other hygienic practices.